Dental prophylaxis, or cleaning, is an important part of a healthy oral care routine. Prophylaxis refers to an action carried out for the prevention of a disease. Dental cleanings are examples of preventative measures taken to inhibit the development of tooth decay and gum disease and promote a healthy smile. Though most people brush their teeth at home on a daily basis, lingering food particles can harbor bacteria that form a sticky plaque on the surface of the teeth. Though hardened plaque is not removable with regular brushing, it comes off easily during a professional dental cleaning. Left unaddressed, plaque can lead to serious oral complications such as tooth decay and gum disease. 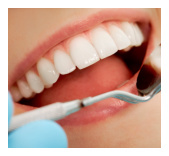 Dental cleanings take only a few minutes and are performed from the comfort of a dentist’s office. Several tools are used to gently scrape away plaque and clean the surface of the gums and teeth. Most cleanings begin with an ultrasonic cleaner and water sprayer, which are used to dislodge plaque formations. Any remaining plaque is scraped away using a metal hand scraper, and a rotary brush is used to polish the newly cleaned teeth. The American Dental Association recommends dental prophylaxis on a routine basis. If you have not undergone periodic dental cleanings, it is never too late to begin taking better care of your teeth. Contact our office as soon as possible to schedule your next visit and begin your path to healthier teeth and gums. Dental X-rays are one of the most important part of your regular dental treatment. Your dentist uses the specialized imaging technology to look for hidden tooth decay – also called cavities – and can show dental issues such as abscessed teeth, dental tumors, and cysts. Additionally, your dental X-rays allow your dentist to see the condition of prior dental procedures, such as fillings, crowns, root canals, and bridges. And, too, your dentist will be able to look for possible bone loss as a result of periodontal gum disease and find hidden tartar build up. While the office maintains Monday-Friday hours, we are also available for emergencies. We strive to provide the finest quality dental care to our patients.